Issue two of Terry Moore and Humberto Ramos’ Runaways arc is everything an issue of Runaways needs to be great. It has humour, action, drama, great characterization, and something about it separating it from conventional super hero books. While the artistic style of penciller Humberto Ramos is driving me crazy, Terry Moore’s script keeps pace with the elements which made Runaways great before Joss Whedon. Terry Moore’s script is fairly action heavy and clunky at the beginning, solving immediate issues quite quickly before settling in for a dialogue heavy issue. Issues like these in Runaways are perfectly fine, with such a great and established cast, Runaways never really needs something to punch to cover up for bad characterization. The initial problems are barely Moore’s fault anyway, but more on this below. Mostly an interrogation, Moore explores the motivations of the enemies from Karolina’s home world through a discussion with one of them. But what makes this entire issue not fall flat or become simplistic is Moore’s ability to weave the problems and drama below the surface into the main plot. The questioning of the captured enemy takes its toll on the cast and becomes a challenge to who they are and the relationships they formed. It works very well, with Moore taking a particular interest in Karolina and Xavin’s relationship. 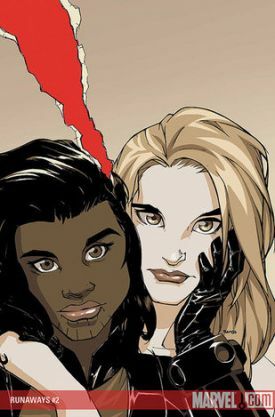 Previews for this arc of Runaways became a hotly debated topic as fans became scared of what Moore will be doing with Karolina and Xavin and their relationship. While I do not support a break-up of these two, I do support tension between them, no one wants to read about happy couples. I also believe in Moore’s ability as a writer, something he has proven in the past. So while rough seas are ahead for all the Runaways, what other way would readers want it? Humberto Ramos’ art is driving me insane. While I will admit when I first opened the first pages of this issue I was impressed, a closer look immediately made me groan. The colouring is great, with the alien invaders looking great as they power up against the Runaways, as does they’re powering up against their new threat, but they still look ridiculous. The characters eyes are the size of dinner plates, stuck inside giant faces which make the characters look like bobble heads. The scenes of the cast eating pizza look particularly bad, with Nico opening a gaping mouth to a dripping slice while her eyes have seem to magically shrunk down to below average size. The only scenes which actually don’t look over the top and much to cartoonish are with Karolina interacting one on one with Nico and Xavin. Ramos manages a subtlety which works well, while the rest feels like a bad joke. 7/10 Great script relying on strong characters. Poor art with little redeeming qualities.